Mount heavy cinema lenses on your Sony digital cinema camera with this Chrosziel Bridge Plate Kit. The 19mm bridgeplate is compatible with Sony's F23, F35, and F65 cameras. The included riser plate also allows for the mounting of Sony's F5 and F55. A pair of 19mm rods is included for attaching the lens support. The 19mm studio standard can fit large diameter lenses, whose weight unsupported can damage the camera, and they can support additional accessories like matte boxes and follow focuses (available separately). 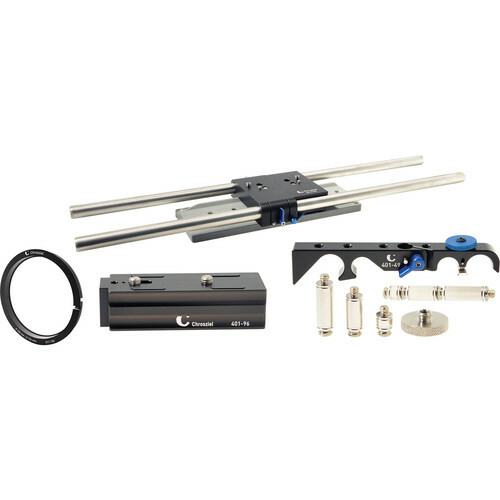 The Bridge Plate with 19mm Rods for Sony Digital Cinema Cameras from Chrosziel allows you to adjust the camera's center of gravity on the tripod. The bridge plate features a pair of 19mm rods 25.6" (650mm) in length and is compatible with the Sony F5, F23, F35, F55, and F65 digital cinema cameras. It is also compatible with the Phantom Flex and can be used with the Chrosziel LWS 15 HD Universal Baseplate to support other digital cinema cameras. The LWS Baseplate for Sony F5/F55 from Chrosziel allows you to place your Sony F5 or F55 at the correct height for use with the 401-F235 Bridge Plate with 19mm rods. The Lens Support with QuickFit from Chrosziel is a universal 15 and 19mm lens support bracket. Three, combinable, support stands, with lengths of 14, 27, and 35mm, are included. The lens support is designed for lenses with a 1/4" or 3/8" threads.